Selfies are actually nothing new. Artists have been making selfies for centuries. It just happens to be easier for everyday folks nowadays to produce self-portraits. I’m presenting you with these historic selfies because they are a) artists with whom you might not be wildly familiar and b) they’re darn interesting people! 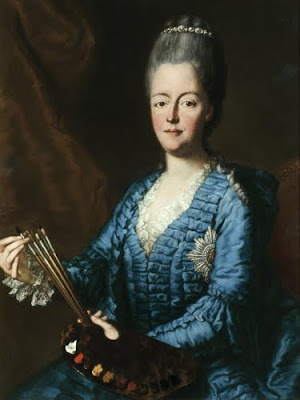 I’m really not into royalty or who is from which noble family, but, this woman is particularly interesting, since her life revolved more around the arts than her “high birth.” She was the daughter of a Holy Roman Emperor, which made her Grand Duchess of Bavaria. She was married to the Elector (Prince) of Saxony, so she was also a princess who ruled as regent after her husband’s death. But, she was also a businesswoman (she established a brewery), a musician, and a painter. This accomplished self-portrait depicts a sympathetic person, confirmed by accounts of her record as princess. Not only did she write operas and perform in them (at court), she also wrote lyrics for other composers’ operas. She had nine children and was dedicated to raising them, participating very little in all the hoopla in her husband’s court. She is also said to have been committed to distributing food to the very poor. In this self-portrait she’s wearing a Brunswick dress. It was a two-piece ensemble supposedly modeled on the dress of common people with a waist-length jacket and ankle-length full skirt. I always get a kick out of seeing painters of the past dressed in such fine raiment while holding a palette and brushes! As a child I grew up seeing the works of this awesome artist in Bern and Geneva, Switzerland. A lot of his work are murals that marked great moments in Swiss (military) history. What I liked more were his landscapes of the Lake of Thun and the Lake of Geneva, done in a minimalist style with simplified forms and the vibrant colors of Impressionism. Hodler was born in Bern and studied painting in Geneva and later Madrid. The artists who interested him cover a wide range: Northern Renaissance masters like Holbein and Dürer, the Baroque master Rubens, and Realist painters Corot and Daubigny. 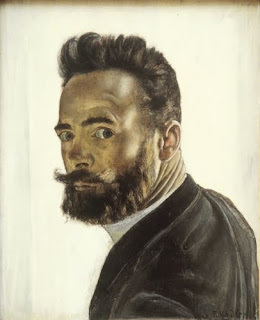 Although his early paintings were realistic depictions of Swiss rural life, after a psychological crisis in the late 1880s, his subject matter took on a Symbolist content that was sweeping European art at the time. 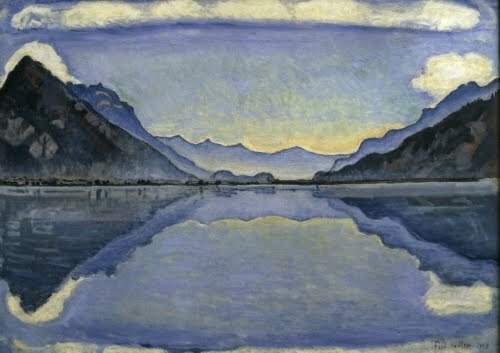 The Symbolist element was enlivened by his brilliant palette, especially is simplified alpine landscapes. This selfie has a wonderful confrontational attitude to it. While realistic in style, it exudes Hodler’s vibrant personality. His paintings from this period until his death reflect his search for a reality beyond the physical world. That’s why his landscapes often seem so other-worldly, just like this selfie on a stark blank background. Because Poland was part of the Austro-Hungarian Empire in the late 1800s, the significant art center cities of Krakow and Warsaw had cultural and artistic ties to Vienna and, beyond that, Paris. The son of an established sculptor, Stanislaw Wyspianski studied painting in both Krakow and Paris. In Paris he befriended Post-Impressionist Paul Gauguin (1848–1903) in 1894, although Gauguin’s bright palette did not drastically affect his more traditional palette. Wyspianski, who has a museum dedicated to his work in Krakow, was a true Renaissance person. He not only had a successful career as a painter, he also was a playwright, architectural restoration designer, and a designer of stained glass and theater sets. He was allergic to oil paint and eventually preferred pastel. 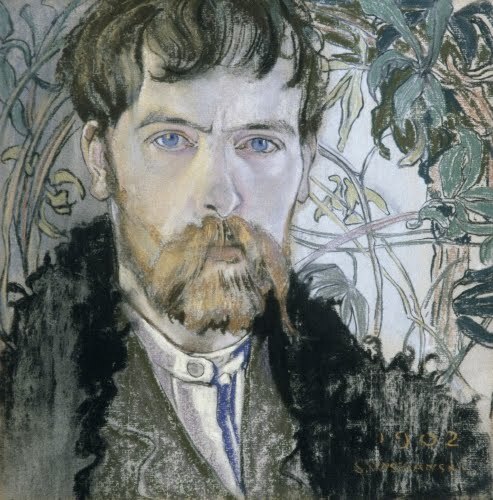 This artist was one of the first to be invited to join the Vienna Secession in 1897. This was a group of young artists who were dissatisfied with the conservative academic curriculum in Austrian art schools. They also sought to unite the disciplines of design with fine art. Art Nouveau had a major impact on the preferred style of its artists and designers. This selfie is a lovely combination of realism with the floral linearity of Art Nouveau. This selfie would make an interesting comparison to that of Gillian Wearing later in this post. The inspiration for this work is obviously much different from that of Wearing’s. This selfie is tongue-in-cheek, rather than an investigation into actual looks or psyche. It was part of a portfolio of prints by eleven different artists, most of them from the so-called Young British Artists group. Unlike most of the other YBAs, Quinn studied history and art history at Cambridge University. His artwork is concerned with exploring the similarities and differences between art and science through the device of casts of the human body. This also incorporates the idea of contemporary ideas about beauty, genetics, and the possibilities, scary or not, of manipulating DNA. This work seems to address the obsession with cosmetic surgery, although with a twist. 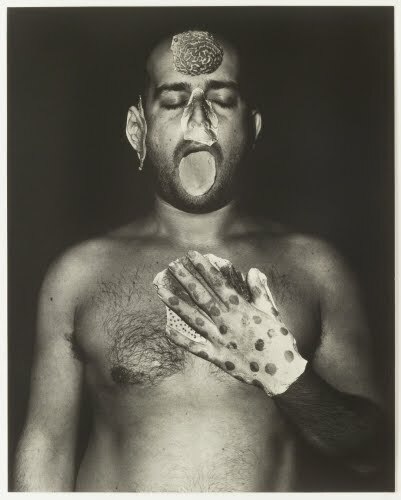 In Quinn’s work, he turns the table on the idea that body modification be only physical appearance. At 80 he seems to want to be a more talented person through transplantation, with collaged photographs of casts of a violinist’s ear, the tongue of a chef, the nose of an entertainment producer, and a brain represented by a bunch of coral. There are no rules in art that a selfie has to be executed in realism. Selfies can express a person’s inner image without being obsessed with naturalism. I don’t think that anyone would challenge the idea that cartoon-inspired art can deliver a message. One strain of Pop Art in the 1960s emphasized the primacy of comic art and animation as subject matter. This vein was revived during the Neo-Pop evolution in the 1980s, in which Nara played a role. Nara was born and raised in rural Japan by working parents. He spent most of his childhood alone with his comics and pets. He studied art in Japan and Germany. Nara is the “father” of the Tokyo Pop movement. He grew up in post-war Japan when the country’s economic boom was characterized by a flood of popular culture from the West, including Walt Disney and Warner Brothers cartoons. 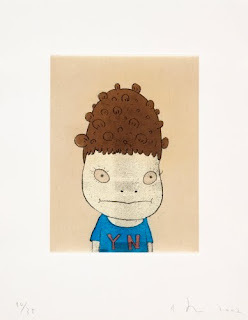 His paintings, prints and sculptures of big-headed, wide-eyed children and dogs reflect not only Western cartoons, but also Japanese manga (cartoons) and anime (animation). This self-portrait expresses the simplicity of a child’s rebelliousness, and communicates a restlessness that reflects Nara’s independent spirit and love of things unconventional. He was very involved in the “punk” scene in Japan in the 1990s. However, the figure is balanced, almost in the Renaissance pyramidal manner, revealing one of Nara’s many artistic influences. As a popular contemporary artist with international appeal, Nara’s Pop art can also fittingly be found on a variety of consumer goods such as T-shirts, postcards, CD covers, and skateboards. With the elevation in dignity and esteem that artists received during the Renaissance (ca. 1400–1600), self-portraiture came into its own. Down through the history of art, we can cite many famous artists who produced series of self-portraits. These artists created self-portraits that were basically documents of themselves. Gillian Wearing’s self-portraits, in dress-up as family members, put a new twist to the concept of “family resemblance.” Based on family photographs, the recreations are aided by elaborate costume and makeup. 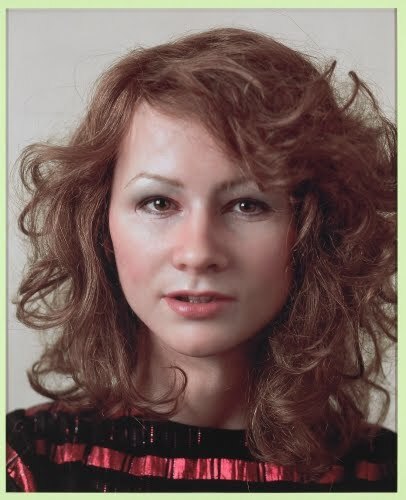 Using special masks, wigs, body-suits and clothing (with the help of artists from Madame Tussaud’s wax museum in London), she transforms herself into family members. The artist’s eyes are the only feature she does not mess with. They present a novel fascination with revealing her identity through her relatives. Wearing’s fascination with revealing people’s often concealed inner identities brought her international acclaim in 1992. She created a series of photographs of everyday people whom she urged to write their innermost thoughts on pieces of cardboard. Her photographs explore human relationships and social behavior, extended to the private and personal. Her work is clearly influenced by documentary photography and film. Her combination of Snapshot Realism and a quest for delving into the psychological depths of an individual create a stunningly different take on portraiture in the 2000s.